It will be awesome for you to have a group of women to have fun and cheer with/for. Congrats on making the team! Congratulations! 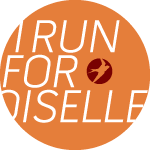 I love Oiselle; they are truly an amazing company! They are so amazing! Thanks.